You are here: Home / News / Several Reasons Why Kamala Harris Is A Neocolonial Enemy Of The Black Community. Several Reasons Why Kamala Harris Is A Neocolonial Enemy Of The Black Community. (ThyBlackMan.com) Recently, Kamala Harris announced that she was running for President Of The United States In 2020 and casual black people like my stepdad who blindly loved Obama celebrated this announcement, but real intellectual black people like myself who hated Obama didn’t celebrate this at all because we did our research and Kamala Harris’s history with the black community in California is based on anti-black neocolonial violence. For those that don’t know what neocolonialism is, to me is basically a white nationalist (white racist) in black face. Here are several reasons why Kamala Harris is a neocolonial enemy of the black community. 1. She’s A Swirler – I’ve written several articles explaining my personal disdain for swirling and it’s toxically detrimental to the black community because those in our community who engage in swirling are willing participants in continuing to maintain the colonial capitalist status quo oppression and exploitation of the black community like Kamala Harris has done with her white ruling class husband. 2. She Viciously Supported Policies That Have Harmed Poor Working Class Black People As Attorney General Of California Such As Locking Up Poor Working Class Black Men- When Kamala Harris was Attorney General Of California, she blocked the release of many black men who were nonviolent second time offenders under the false pretense that it’ll lower the prison labor pool, but in reality she continues to make money from the exploitation of cheap prison labor to this day which is a clear indicative that she’s deeply invested in the private prison system. Under Kamala Harris’s tenure as Attorney General in California, she locked up more black men than any other Attorney General in that state’s history when the incarceration rate greatly skyrocketed from 52% in 2003 to 67% in 2006. The mass incarceration problem definitely peaked under Kamala Harris’s neocolonial reign of terror against the black community in California. 3. 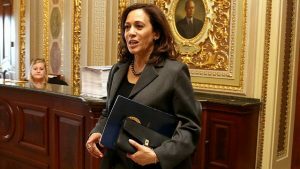 She’s Also An Enemy Of Poor Working Class Black Women – When Kamala Harris was Attorney General Of California, she viciously threatened to impose a 1 year prison sentence against poor working class black mothers whose children had refused to go into the psychological slaughterhouse of a prison called “school”. What’s even worst about the truant policy that she championed for is that these types of policies are some of the most vicious and destructive laws ever inflicted against our community because they impose stiff jail sentences and heavy fines up to $300. Recently, a 2010 video of Kamala Harris appeared online showing just how vicious and remorseless she really is towards the black community in California by defending her vicious “war on truancy” which is really a codeword for war on black mothers. The Conclusion – The point that I wanted to get across with the article is that not all black folks are kind folks meaning just because they’re black doesn’t mean that they’re for the black community and Kamala Harris is purely anti-black and there’s no debate about it. Psychological slaughterhouse called school??????? What? In this article you state that, “Under Kamala Harris’s tenure as Attorney General in California, she locked up more black men than any other Attorney General in that state’s history when the incarceration rate greatly skyrocketed from 52% in 2003 to 67% in 2006.” There is only one problem: she was served as attorney general from 2011 to 2016.